Clear front makes it easy to view a customized title page against a colored background. Durable, coated, textured back cover resists water and tearing. Non-stick material won't lift print. Three metal fasteners securely hold up to 20 sheets of three-hole-punched pages. Avery Durable Clear Front Report Cover w/Prong Fasteners, 1/8" Cap, Clear/Red, 25/Box - Durable report cover lets the quality of your work shine through with a transparent front for your personalized title page. 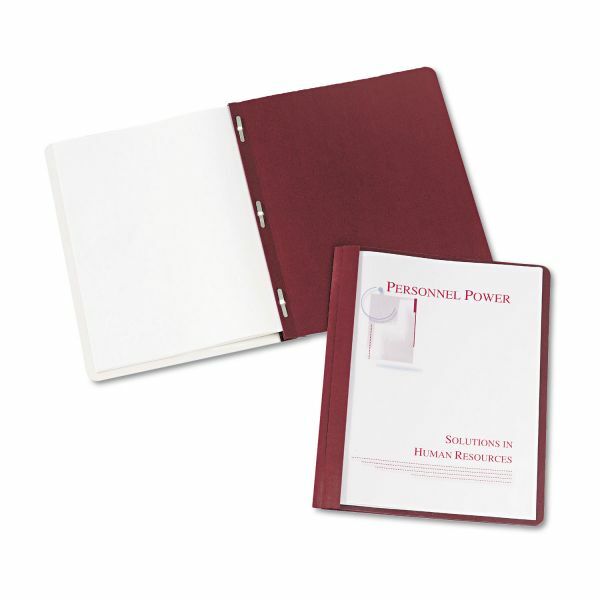 The durable, back cover and spine are made of embossed paper that frames your report with attractive color. The special coating on the paper adds shine and makes it more resistant to water and other damage than uncoated paper. Your letter-size, three-hole punched pages are held securely by three metal fasteners. Predesigned templates are available online and provide easy customization of title pages. 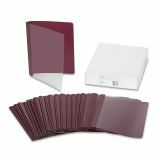 Each report cover holds up to 1/2 or 20 sheets of letter-size paper."